….One of the most beautiful places in Thailand, but one that seems to be rarely written about. Because it’s a bit off the beaten track. 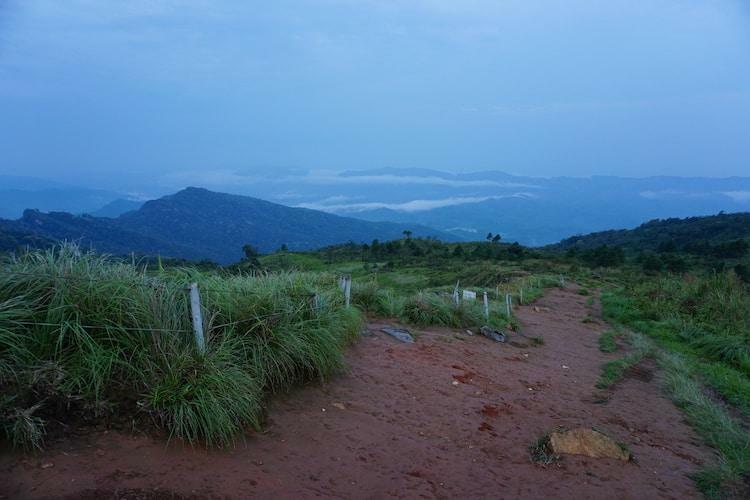 Even for those travellers who make it as far as Chiang Rai, it’s still another 90km to Phu Chi Fa across some mountainous terrain. And given it’s famous for its sunrises, this isn’t something you can do as a day-trip. You’ll need to get there, stay the night, and then be up early the next day to catch the sunrise. 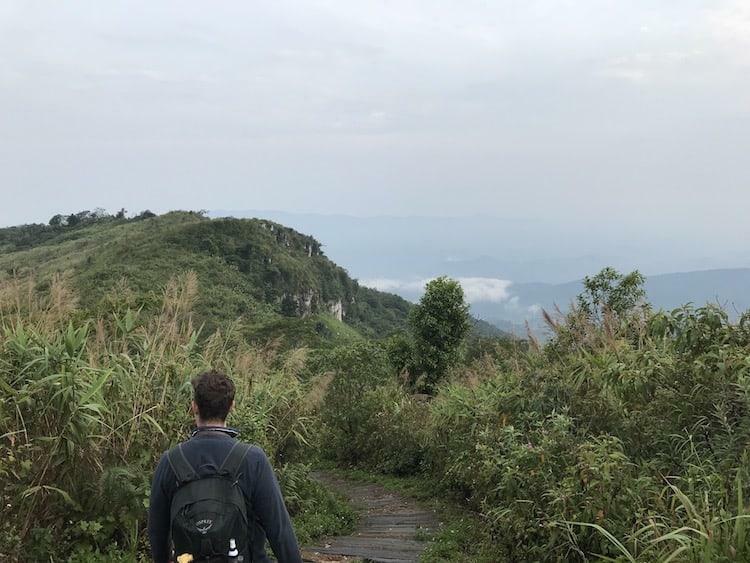 But when I get an idea in my head, it’s hard to shake it, so we decided to hire a car from Chiang Rai, and head out on a three day road trip with our first destination being Phu Chi Fa. The first step was getting a car and this turned out to be fairly easy. We booked with Hertz at Chiang Rai airport, and just got a taxi to go and pick it up. Total cost was about £65 for three days worth of hire, and the taxi to the airport was only 150 Baht. It’s worth noting that on Thai automatic gearboxes there are three settings, D for standard drive, S for sport (haha!) and B which is used to engage the clutch on steep downhill sections. I had not seen this settings before, so am not sure if this is universal in Thailand, or just the brand of car we hired. The drive to Phu Chi Fa was fairly easy, and only took us a couple of hours. The roads are really good, paved the entire way with some nice viewpoints to stop off in the mountains. Thais drive on the left hand side, which is perfect for us Brits, making the adjustment alot easier. Once outside of Chiang Rai, there was barely any traffic, and the countryside is simply stunning. It seems to change every 20 minutes or so, from farmland to forests, mountains to rivers. The little towns and villages were beautiful each having their own unique temples and Buddha images. 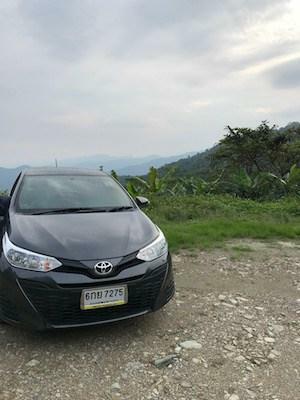 Our little car struggled up the hills. Its tiny engine and automatic gearbox made the steepest climbs a really challenge, but we got there! TOP TIP: I would suggest downloading the fantastic app Maps.Me before you leave. This allows you to have offline maps that will help you to navigate to Phu Chi Fa without having to use any international roaming or data fees. You can just choose your location (use the map below for where we drove to) before you leave and it will direct you. We used it and it got us to Phu Chi Fa without any problems. 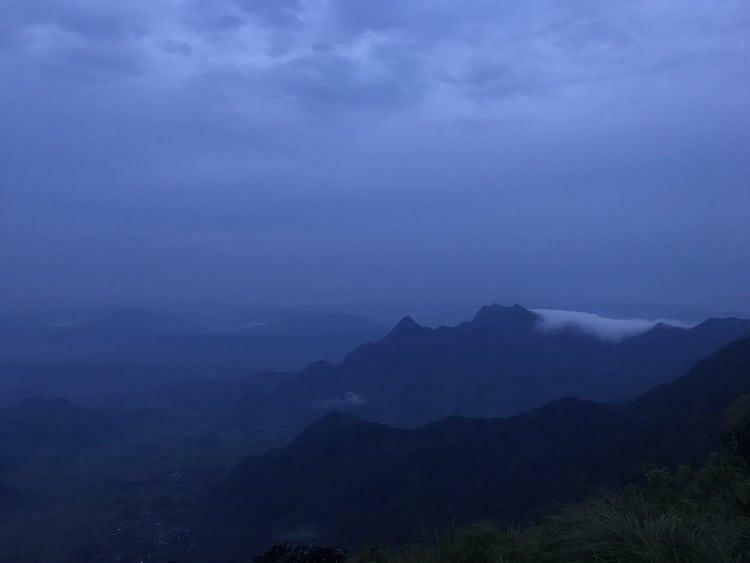 We decided it would be a good decision to climb Phu Chi Fa in the daylight first so we were fully prepared for what awaited us at dawn the following day. We used the destination on the map below to navigate to. The right hand turn off the main road is not very obvious, and looks like a private road to get to a guesthouse. The last couple of kilometres to get to the car park is incredible windy and steep. In our little car there were points where I had my foot completely down and we were barely moving! I am not that skilled a driver, so you should be fine, but the first time you try it you will be a little shocked! Once you reach the point on the map above you will be at a little car park. In the corner, in-between some stalls (which I assume have sellers at them in the busy season) there is a path that cuts up the mountain. It starts off as steps, before changing to a footpath. About halfway up you reach a kind of ‘t-junction’. you will need to go left, up some more steps which are carved into the hillside. Be careful as this bit was really slippery as the steps are literally just cut into the mud. There are alot of questions on other sites about how hard the climb is. It is really hard to judge other people’s levels of fitness. What I would say is that neither of us are in great shape, but we both have jobs that involve us walking a fair bit. I would probably say it was about a 6/10 in terms of toughness of climb. It took about 15 minutes to get to the top, and we stopped a couple of times for a rest. We were doing the climb in flip-flops today, so that should tell you it’s really not too bad! TOP TIP: Make sure you’ve covered yourself in bug spray, and you’ve got some with you to re-apply at the top. There are alot of flys on the way up, who are ready to feast on sweaty walkers! The view from the top of Phu Chi Fa is simply staggering, and makes the hike up more than worth it. 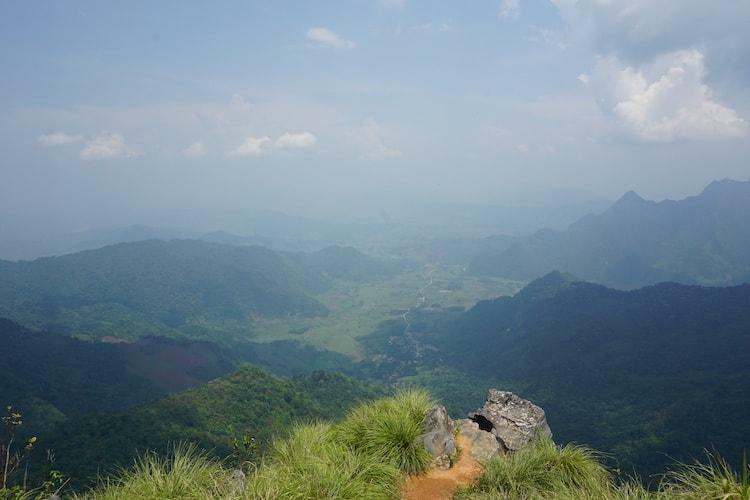 You can see out for miles, down over villages in the valleys of Laos and the meandering Mekong river. We were the only ones up here at this time of day, with this entire view to ourself. Other than a couple of Peregrine Falcons fighting for some scraps of food, there was no sign of life until the chimney smoke from the traditional houses below us. 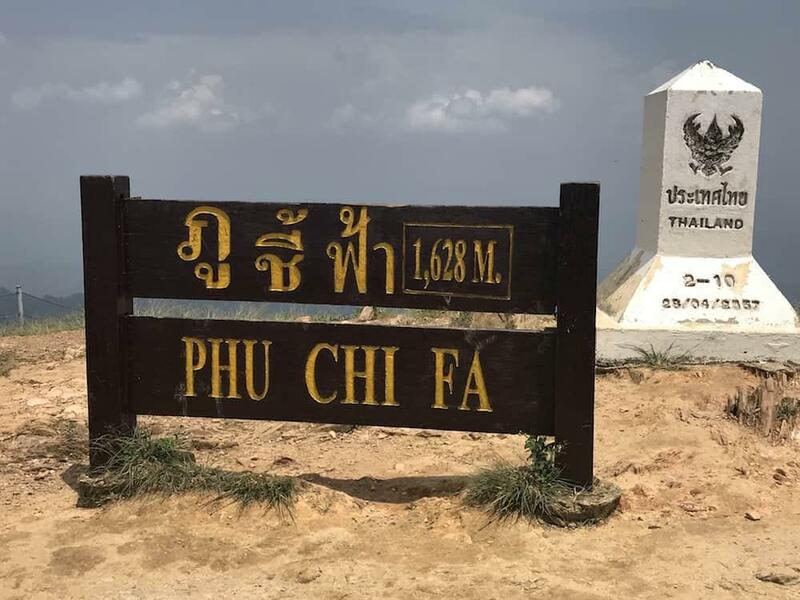 TOP TIP: One thing we didn’t realise is that the top of the Phu Chi Fa is actually right on the border of Thailand and Laos. You can cross into Laos here without any visa needed! Here we are joining the divide across two different countries! The next morning we set our alarm for 0400. This was far too early, but we didn’t want to miss out! 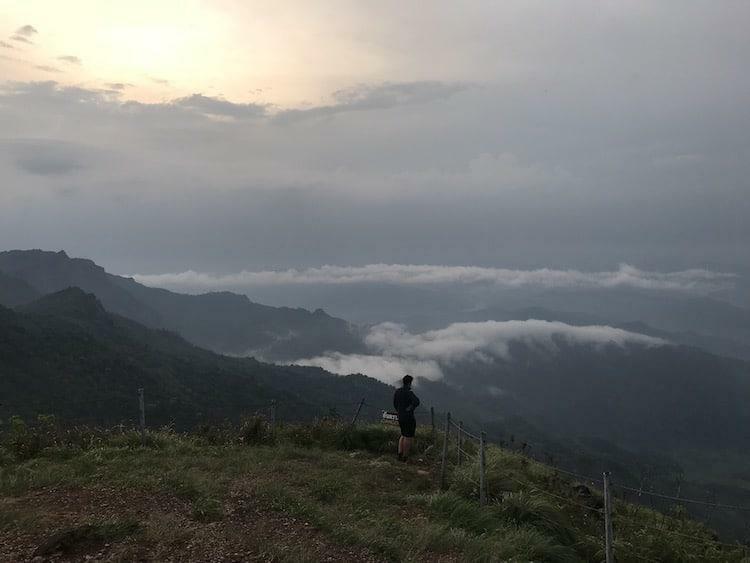 We were staying about half an hour’s drive from Phu Chi Fa, so by the time we arrive it was about 0515 and the sun wasn’t due to rise until 0550! Nevermind, we headed up anyway, and this turned out to be the right decision as some of the most beautiful moments were the purple skies just before dawn. We ascended the mountain again, this time in trainers, which was much needed given how slippery the path had become with the morning dew. TOP TIP: Bring a torch with you. Whilst part of the path is lit up, it does not extend all the way. The view from the top was magical. The haze and tropical greens of the previous afternoon had gone, replaced with purple skies and cloud rising and falling over the distant mountain tops. It had been a long time since I’d seen the sunrise, and I’d forgotten how much I love it. It is a time of day that fills me with with optimism, a new dawn with fresh bright new hours stretching out in front of you. The colour changes drastically over such a short period of time and, unlike a sunset, what you are left with is beautiful sunshine rather than darkness. We weren’t quite treated to the ‘classic’ Phu Chi Fa view. In those the valley fills with clouds, and you feel like you you are flying above them looking down on the world. The mist did its best to sweep in on a few occasions though, before quickly descending and disappearing completely as the air heated up. Over the course of half an hour, the purples transitioned through saffron and orange before the sky took on its blue colour ready to face the day ahead. Unlike yesterday we were not alone on the top. There were a few people who’d made the trek up to see the sunrise. 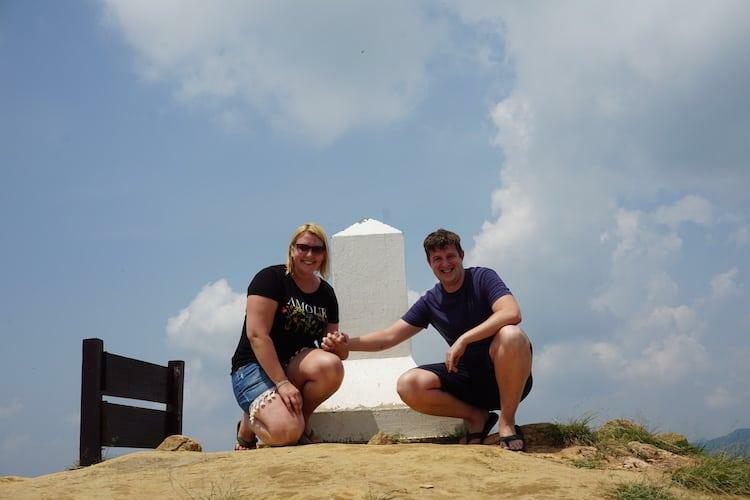 One couple, who were on their honeymoon and over from the States, also had a drone with them! He took some incredible shots across the valley and this great photo of us all on the top. 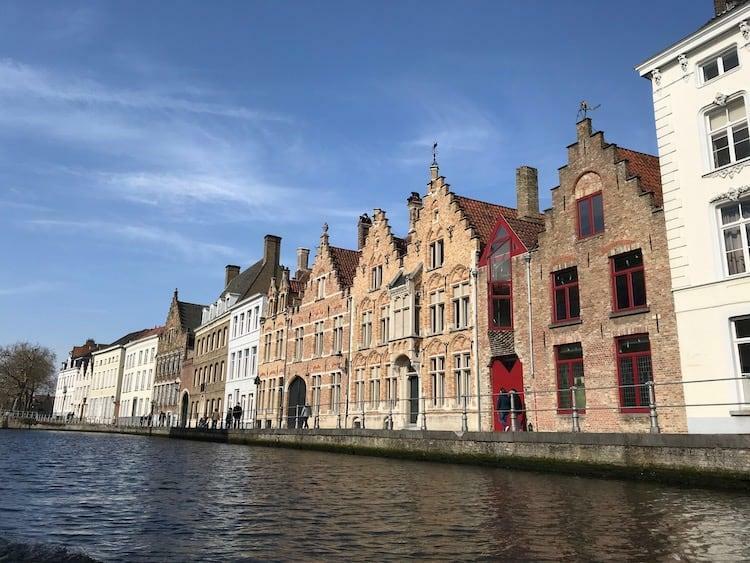 I love travel for so many reasons, but the people you meet on the way create the strongest memories, and we were so pleased when an email from Mark popped up in our inbox linking to the incredible shots he’d taken. 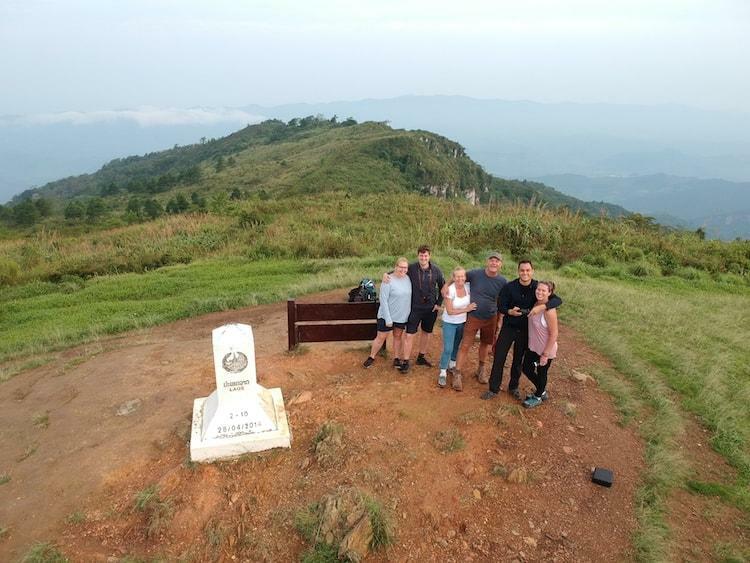 Here is the video he shared with us, and his wife Katie also has a blog, where you can find more information about Phu Chi Fa. TOP TIP: If you head up in the wet be on the watch out for leeches. If you have them, wear longer socks to try and stop them getting to your legs. 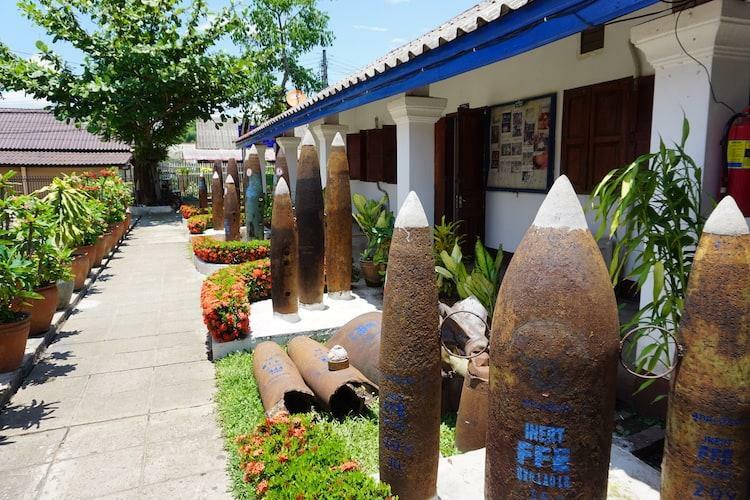 If you have any questions about Phu Chi Fa that I haven’t answered in the article then ask them in the comments below and I will get back to you.